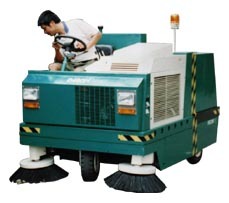 The retractable anti-shock side brushes (FELLOW patent) enable to sweep into confined areas. The debris container (200L) increases overall productivity and can run for long periods without needing to be emptied. Filter is provided with an electrical safety shaker. Absolutely dust control, dust will not flying during sweeping.